Issuing a clarion call to Americans saddled by student debt, President Barack Obama urged student borrowers Tuesday to stand up for their rights, and announced a medley of modest steps to bring some order to a notoriously chaotic system. 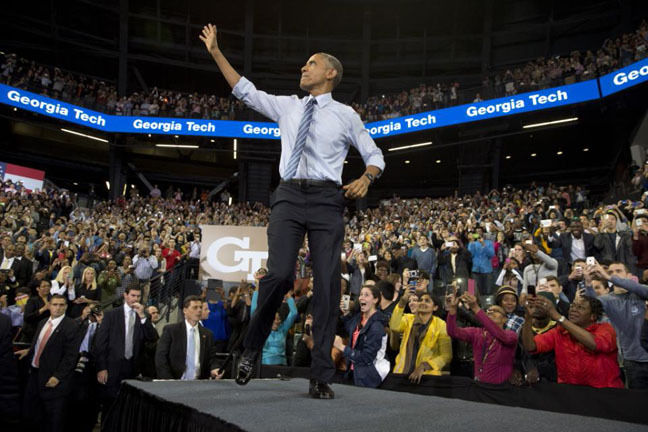 Obama unveiled his “student aid bill of rights” before a gymnasium packed with nearly 10,000 students at Georgia Tech, where he said the nation must mobilize to bring about deeper changes to student loans. Not only should every American be able to afford college, Obama said, they also should be able to afford the loan payments that kick in with a vengeance once they graduate. In the Oval Office ahead of his brief visit to Atlanta, Obama signed a presidential memorandum with policy tweaks that don’t require new legislation from Congress — a plus as far as the White House is concerned. The memo targets third parties like Navient — formerly Sallie Mae — that contract with the government to collect on loans. Those companies will be required to better inform borrowers about repayment options and notify them when they are delinquent, the White House said. Obama also called for a single website where students can see all their federal loans in one place — a major problem for students with multiple loans or debt that's been sold from lender to lender. He also called for a website where borrowers can file complaints. The presidential steps aim to crack down on a student loan system known for being complex and confusing to navigate. In recent years, lawsuits and critical government reports have cast a light on industry abuses and the difficulties facing borrowers. A Consumer Financial Protection Bureau study last year found borrowers were getting little help when they ran into trouble and had few affordable repayment options. And in May, Sallie Mae reached a $60 million settlement with the Justice Department to resolve allegations it charged military members excessive interest rates and improperly sought default judgments. When Vickie Kight of Houston couldn’t afford to pay the interest accruing on her loans, she turned to her loan servicer for help — and says she didn’t get it. Her wages being garnished, Kight dropped out of Louisiana’s Southern University, returning to school only years later once her finances were under control. Obama also floated the possibility of proposing legal changes to how student loans are affected by bankruptcy. Currently, student loans cannot typically be discharged even in bankruptcy. His memo also requires servicers to apply early payments to loans with the highest interest rates, helping students pay off debt faster. Although Obama has long lamented the high cost of college, he’s run into obstacles that have limited his efforts to improve the situation. Using his executive authority, Obama expanded a federal repayment plan to allow more low-income Americans to cap their payments. But when Obama this year proposed to eliminate the “529” college savings plan to make way for education tax benefits, opposition was so strong that he had to jettison the idea. And the president’s $60 billion pitch this year for two years of free community college has gained little traction in the Republican-controlled Congress. The government estimates total U.S. student debt exceeds $1.1 trillion, with around 7 million Americans in default. Before returning to Washington, Obama was to headline a fundraiser for the Democratic National Committee, which is beginning to gear up for the 2016 presidential race. Roughly 25 donors paid up to $33,400 to attend. Associated Press writer Nedra Pickler in Washington contributed to this report.